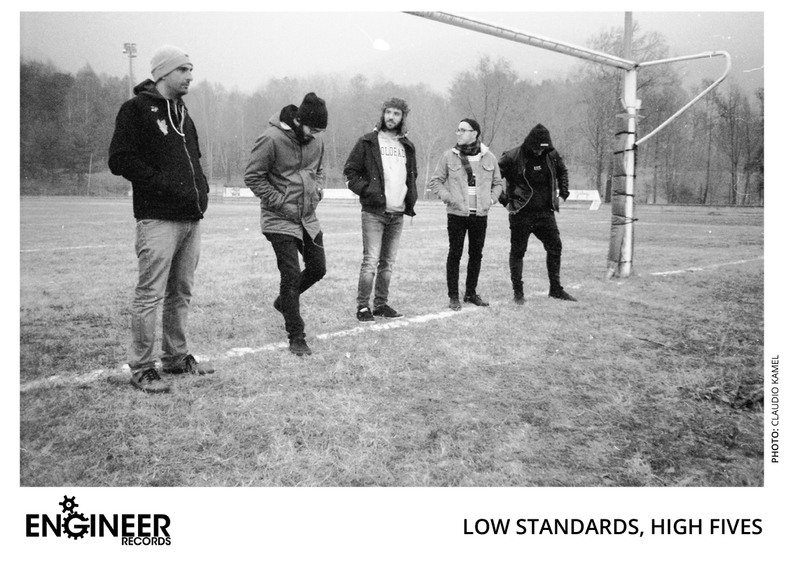 Showcasing their flair for raucous post-punk guitar assaults infused with an inescapable melodic sensibility, Turin (Italy) based rockers 'Low Standards, High Fives' voraciously unleash their 'Silent Decor' video single. Taken from their debut full length album 'Are We Doing The Best We Can?' to be available by UK/US label Engineer Records from 31st March 2018, the alt-rock crew offer 'Silent Decor' as a pay what you want offer via their bandcamp page. Originally forming in 2012, the band have continually evolved to shape their sound and musical direction. Expanding to a 5 piece in 2015/2016 proved to be a catalyst for creating a formula that would propel their popularity and enable them to open stages for the likes of Ratboys, Foxing, Fine Before You Came, Dowsing and many more. Having completed their debut album throughout 2017, Low Standard, High Fives are gearing up to bring their music to a wider universal audience of music fans who like their gritty rock tastes akin to bands such as Jaw Breaker, Kover, Hunter Gatherer and Red Car Burns.